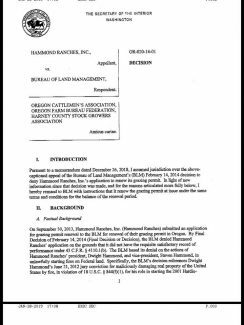 Hammond Ranches, Incorporated’s (Dwight Hammond and Steven Hammond of Burns, Oregon, and family) BLM permit has been renewed. 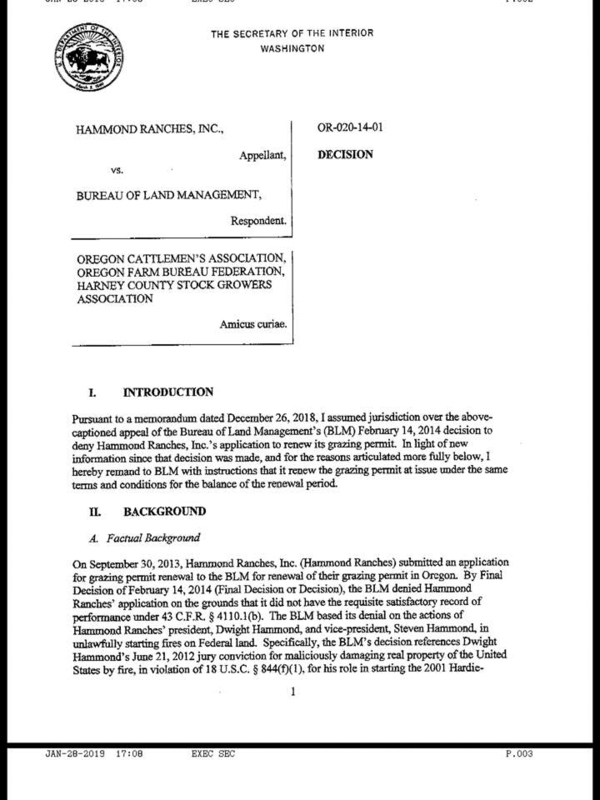 In a document dated Jan. 28, 2019, the Harney County Stockgrowers Association, the Oregon Cattlemen's Association and the Oregon Farm Bureau Federation received word from the acting Secretary of the Interior that he has remanded the BLM "with instructions that it renew the grazing permit at issue under the same terms and conditions for the balance of the renewal period." Jeff Maupin, the president of the Harney County Stockgrowers Association, said he and the former president, Travis Williams, along with Wayne Smith and the HCSA executive committee worked together earlier this year to procure the services of Karen Budd-Falen and another attorney in her office, Conner Nicklas, to submit an Amicus Brief urging the judge to rule in favor of Hammond Ranches, Inc., and reinstate their grazing permit in light of the fact that Dwight Hammond and Steven Hammond had received a full pardon from President Trump. The Stockgrowers received word on Dec. 26, that the Department of the Interior had assumed jurisdiction over the Hammond Ranches, Inc., v. Bureau of Land Management case (the Hammond family's request for reinstatement of their permit). "We felt pretty good about it at that point," said Erin Maupin, friend and neighbor of the Hammonds, and Jeff Maupin's wife. Jeff received word at 2 am on Jan. 28, 2019, that Secretary Zinke had, indeed, decided to renew the Hammonds' grazing lease. Jeff, Williams, Smith, the entire membership of the Harney County Stockgrowers, along with the Oregon Cattlemen's Association and the Oregon Farm Bureau, who both filed supporting briefs, and many more are to credit for the decision, said Erin. The 25-page brief that Budd-Falen authored and submitted was intriguing, she said, and laid out the argument that, because the Hammonds received a full pardon, the government should be require to "give back" anything that had been taken while they were under the assumption of guilt. "They did a lot of research. They had to go all the way back to the Civil War to find something that was similar," said Erin. Indeed, the brief references President Lincoln's pardoning of the Confederate soldiers following the war, and that the Supreme Court ruled in 1862 that an individual was entitled to property that had been confiscated during the war because the soldiers had been totally pardoned. The Maupins are grateful to their community for the support the Hammonds have received and Erin believes that Dwight and Steven are thankful to everyone who has helped them. –Editor’s note – a longer story is in the works.